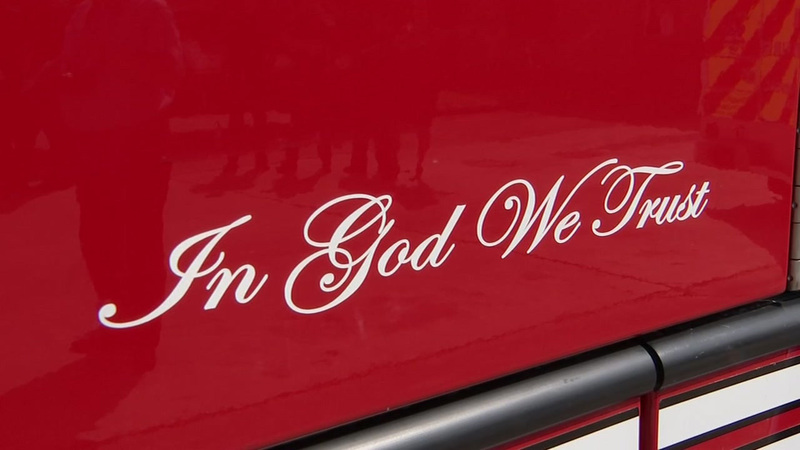 BAYTOWN, TX (KTRK) -- "In God we trust" decals are being displayed on city fire trucks and ambulances in Baytown. Baytown City Council supported the move. Similar stickers were placed on city vehicles in Katy, Angleton and Liberty County recently. Baytown City Manager Rick Davis says he has another idea where the motto can be placed. "The fire department came with the union and proposed the idea -- also something that is being greeted very warmly by other emergency responders, and so I also mentioned that I would like to see it in City Hall. So you might say this idea kind've spread," Davis said. The American Civil Liberties Union says stickers placed on public vehicles is a violation of the separation between church and state.